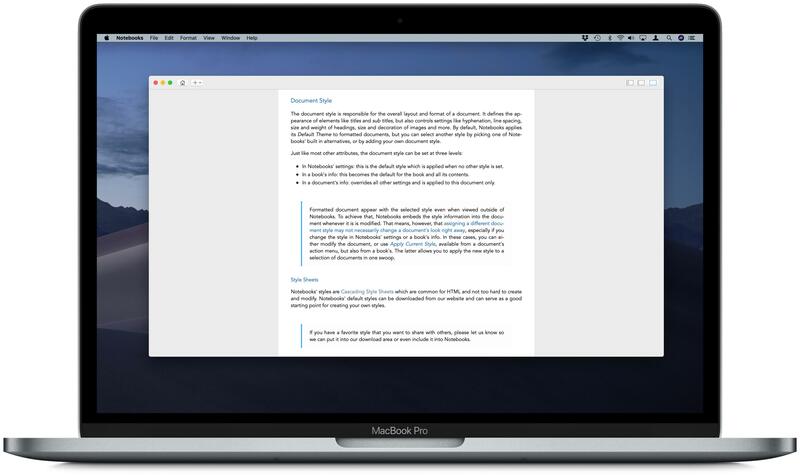 A major update of Notebooks for Mac will be available soon, so we invite you to participate in the current public beta program. 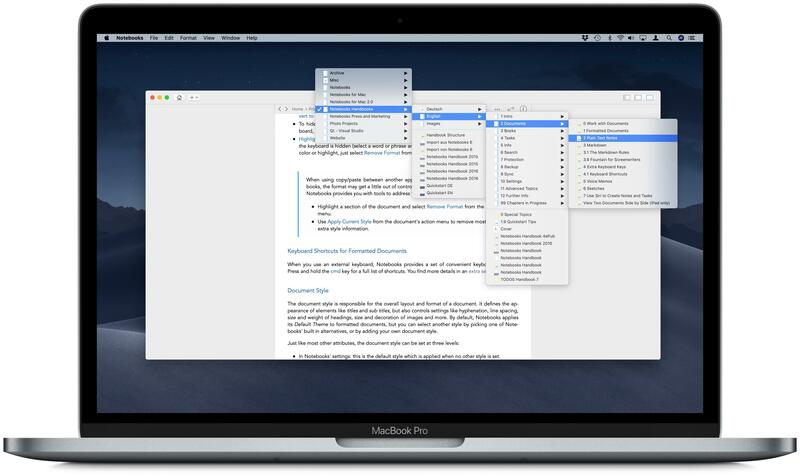 Download and use Notebooks 2 until the final version will be released. All the details are available on the announcement page. Notebooks for Mac can share its files with the mobile versions of Notebooks on the iPad and iPhone, which allows you to conveniently work on your documents from your desktop, but also on your iPad, iPhone or iPod touch when you are on your way. The synchronization between the devices currently supports Dropbox and many WebDAV servers (with Dropbox currently being the most convenient option). 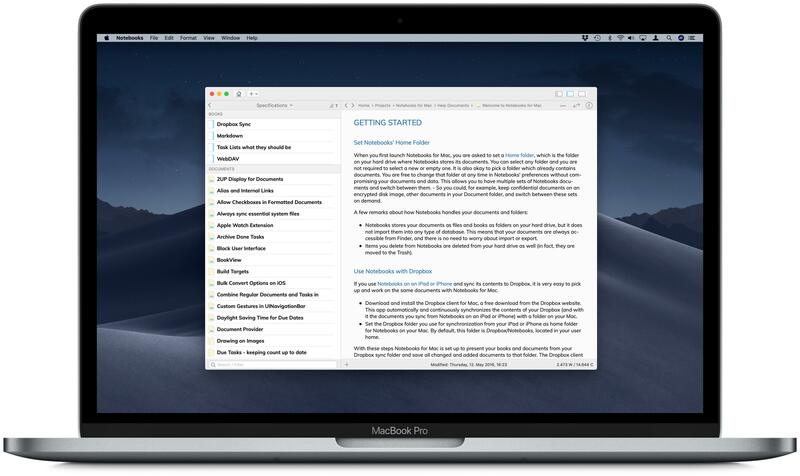 Notebooks 1.4 will soon be replaced with a paid update Notebooks 2, so you might consider participating in the public beta program now and purchase Notebooks 2 when it is released. 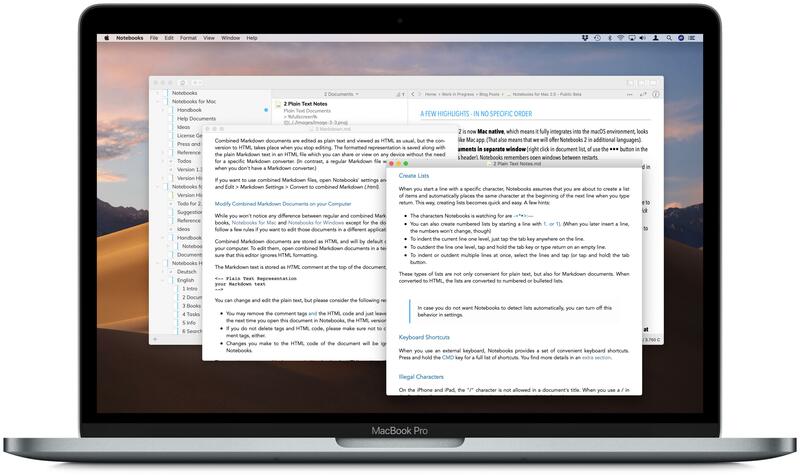 If you do not yet have a valid license file, the Notebooks 1.4 will expire after 30 days. 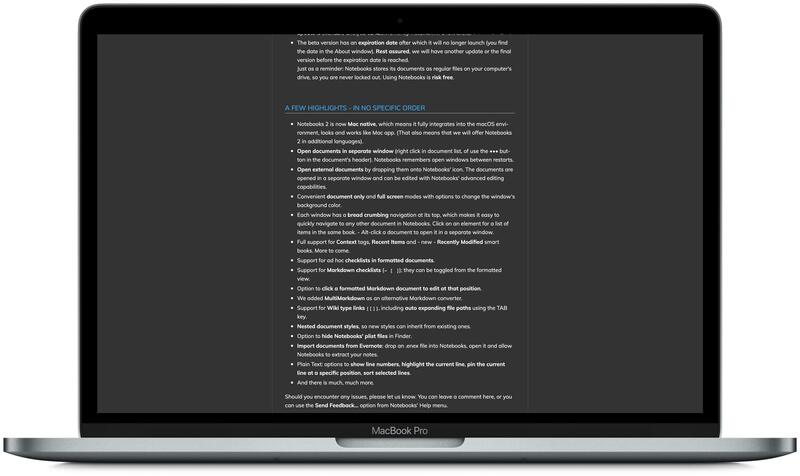 buy Notebooks from the Mac App Store. Should you buy from the Mac App Store or download directly from this site? – Purchasing from the Mac App Store (MAS) is very convenient; you usually don’t need to enter your payment info, and you don’t need to care about updates. On the downside, however, Apple imposes restrictions on apps sold through the MAS by forcing them into a sandbox, which has a few negative effects: Notebooks is unable to resolve hard links, and it is unable to use Acrobat Reader as plugin to display PDF documents. 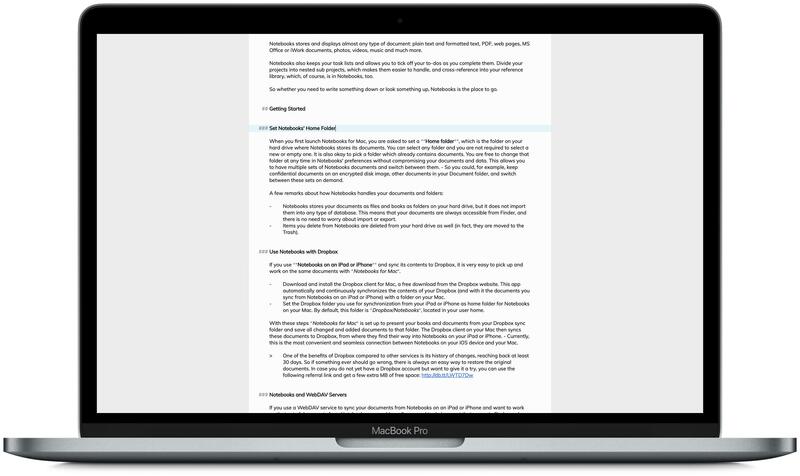 So if you rely on hard links or Acrobat Reader, or if you just don’t like the idea of an app being restricted by macOS, you should download and purchase Notebooks from this site. 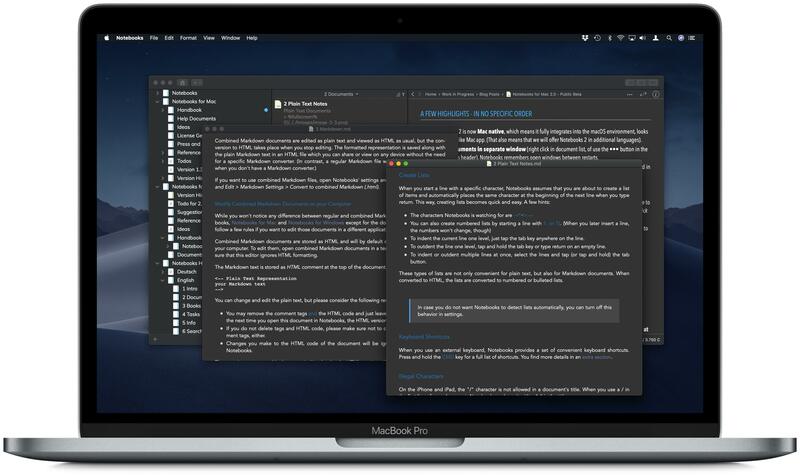 This update addresses a few issues on macOS Mojave and contains general stability improvements. 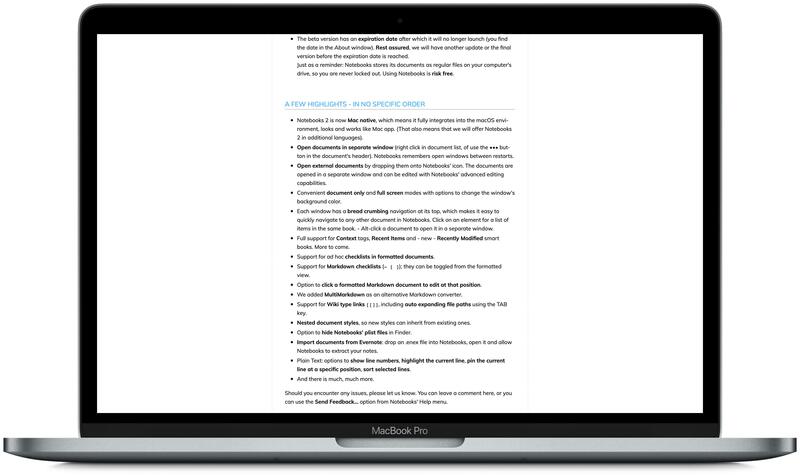 Links in a table of contents (Markdown or formatted documents) and other #anchors work as expected again. Pasting websites or copied HTML into a formatted document reliably extracts and saves contained images. Performance improvements for document list with preview enabled. This is a minor update while we are working on Notebooks 2.0.